Edinburgh is already buzzing with food-related activity! Our plan is inspired by the many people and organisations who are leading the way in delivering positive change by tackling health inequalities, food waste and food poverty. The Edible Edinburgh Sustainable Food City Plan is a tool to help strengthen and expand all this activity. With the plan we aim to find and deal with gaps and to work with as many people as possible to develop Edinburgh as a sustainable food city. The changes we want to see to our food and our city involve nothing less than a cultural shift and can only happen if everyone – individuals, families, groups, organisations and businesses – works together to make our food systems more sustainable. No single organisation or agency can do this alone and Edible Edinburgh can help us join forces for food’s sake! We believe the reward – a city where good food is available for all, making for healthy people, thriving communities and a sustainable environment – is worth it! More fresh, healthy and sustainable food produced and enjoyed. Fewer people living in poverty. Our natural environment and resources are protected and conserved with fewer emissions. A thriving economy with greater diversity in local food production and distribution. A transformed food culture with greater awareness and skills. Create fair and affordable access to sustainable food; ensure people can use it as part of a healthy and nutritious diet. Grow, produce and distribute food more locally while protecting our natural resources and environment. Use our natural resources more efficiently to minimise our ecological footprint and reduce food waste. Develop a thriving local food economy based on businesses and individuals buying more sustainable food. Develop a diverse, independent food sector that offers a variety of skills, training and job opportunities. Inspire, enable and support people to connect with food and the cultural traditions of eating, sharing and celebrating. 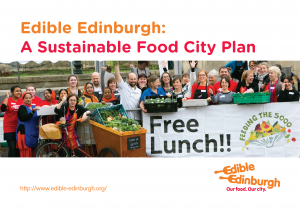 Steering Group members developed the Edible Edinburgh Sustainable Food City Plan. It was launched on 2nd July 2014 at Muirhouse Community Shop and North Edinburgh Arts at a lively event. Edible Edinburgh has been working city-wide with partners across all sectors from health, environment, economy, education and cultural change to stop poverty taking a further hold in our city. In December 2014 Cllr Hinds convened a joint meeting of members of Edible Edinburgh and the Glasgow Food Policy Partnership, together with a number of national agencies, which led to the leaders of Glasgow and Edinburgh Councils issuing a joint statement on food poverty. The statement was issued on 28th February 2015 and was followed by a joint statement from the Directors of Public Health in Lothian and Glasgow on 1st March. 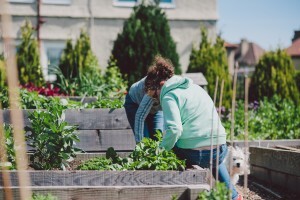 Edible Edinburgh has been actively involved in various events, like Pilton Community Health Partnership’s Good Food for All and the Edible Cities Edinburgh event . We have also provided support to the development of the Power of Food Festival. The Steering group also took part in the launch and consultation on the Scottish Government’s Becoming a Good Food Nation draft policy. Edible Edinburgh believes cities have a crucial role in stimulating the development of more sustainable food systems, through using their buying power to promote sustainable local food, developing local solutions to food poverty and making land available for growing our food. Cities also play key roles in addressing food waste, promoting local tourism initiatives and co-ordinating economic development efforts. Edible Edinburgh’s response can be seen here. Link and overall results of the consultation can be seen here. Our Facebook and Twitter pages are now getting much more active, with nearly 500 Facebook likes and nearly 1,000 Twitter followers. We can act as a useful central hub to get our city’s, Scottish and global food news out to you quickly! 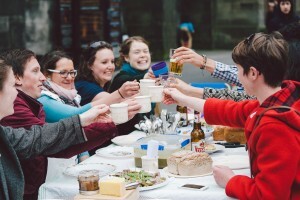 Edible Edinburgh – what do we plan to achieve over the next year? As we move into our second year the Edible Edinburgh strategic partnership plans to step up its role in capturing, coordinating and enhancing our partners’ actions to achieve the Edible Edinburgh vision of a city ‘where good food is available to all, making for healthy people, thriving communities and a sustainable environment’. Addressing Food Poverty. Building on the success of the Joint Council leaders statement on food poverty in February 2015, we will work with our sister organisation in Glasgow – the Glasgow Food Policy Partnership – and national organisations in the poverty, food and community fields to raise awareness of food poverty and its causes and press for change at UK, Scottish and local level. Promoting Land for Community Growing. Edinburgh needs more land for community growing. The Community Empowerment Act will become law in the summer of 2015 providing a new opportunity to address this important issue. Edible Edinburgh will be in the forefront of bringing together partners from across the city to press for the necessary change. Reducing Food Waste. Reducing food waste is a major component of making Edinburgh and sustainable food city, involving action at individual and community, business and national level. Edible Edinburgh’s partners will be leading the way in raise awareness across the city and coordinating action through our thriving waste reduction sub group. Supporting Food Hubs. 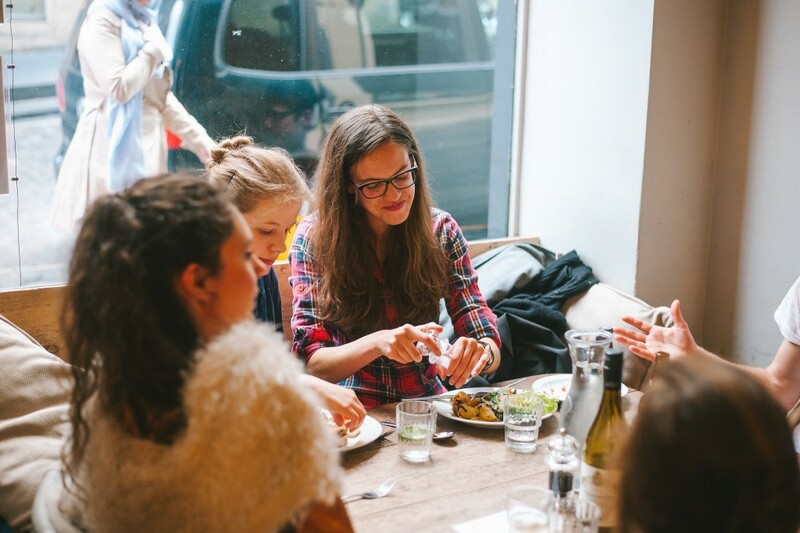 Food Hubs are attracting a lot of interest here in Scotland, across the UK and further afield as a means of promoting food sustainability and preventing and alleviating food poverty. 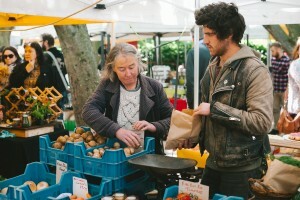 In Edinburgh the Cooperative Capital Programme of the Edinburgh Partnership has made a commitment to creating four new cooperative food initiatives in the city this year. Edible Edinburgh partners will be at the centre of this development, bringing learning from other places and promoting partnership approaches. Promoting Community Action. Edinburgh has a well organised community food sector well represented on the Edible Edinburgh partnership. The concerns of the sector will continue to shape our priorities. Edible Edinburgh is supporting and promoting the Power of Food Festival on 20th and 21st June and launched our new Food City Charter as part of the Festival. Visit the Edible Edinburgh pages on the City of Edinburgh Council’s website. Check out the Sustainable Food Cities website.